Santa Monica, CA – November 27, 2017 – KCRW 89.9 FM, the award-winning NPR station licensed to Santa Monica College (SMC), is giving supporters a sneak peek inside its brand new, state-of-the-art facility during the official grand opening of SMC’s Center for Media and Design (CMD) on Saturday, December 2, at 1660 Stewart Street. 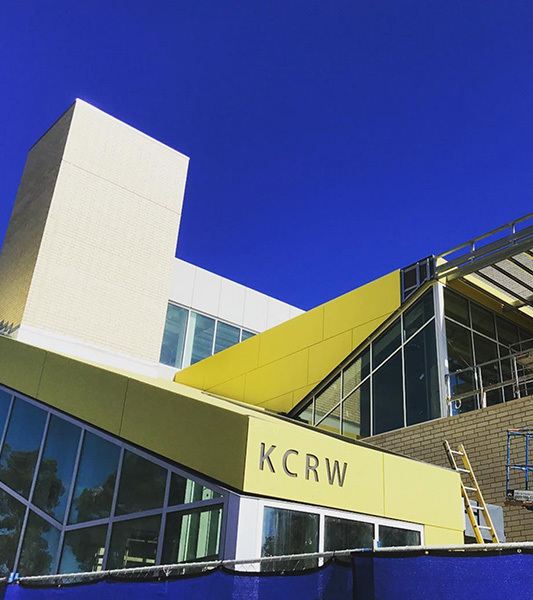 After 35 years in the basement of the Cayton Center at the Santa Monica College main campus, located at 1900 Pico Boulevard, KCRW will begin moving into its new above ground home, the KCRW Media Center, in January 2018. KCRW will fully occupy and begin transmitting from this facility in late Spring 2018. KCRW outgrew its basement studios only a few years after moving to the Cayton Center in 1984. The station has since grown from 14 to 125 staff members scattered across five locations, with broadcast and editing studios on the main campus. KCRW will unite all of its operations under one roof with this contemporary three-story, 35,000-square-foot standalone building. The KCRW Media Center is designed to preserve the station’s collaborative culture, while creating community-gathering spaces, integrating state-of-the-art production facilities, and allowing for future growth. Live music performances, news and cultural programs, a full roster of podcasts, and other innovative digital content for its local and national broadcast and global internet audiences, will be produced at the KCRW Media Center. With a history of bringing unique live experiences to Southern California and around the country, thanks to the largest donor, the Annenberg Foundation, KCRW will, for the first time in its history, be able to host the community at its own 1,400 square-foot Annenberg Performance Studio. 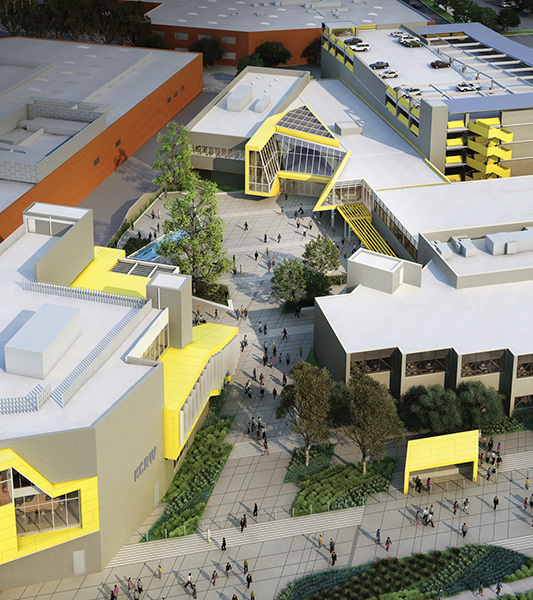 KCRW will also have the opportunity to program events on the 3.5-acre SMC Center for Media and Design campus for up to 1,500 people in the 18,000-square-foot courtyard and an outdoor stage in the center of the complex. All of this allows for the public to engage up close and in person with KCRW. Clive Wilkinson Architects designed this high-tech campus, which will meet LEED Silver Certification standards for maximizing energy and water efficiency, and indoor environmental quality. The SMC Center for Media and Design also includes a renovated 50,000-square-foot instructional Design Wing; a newly constructed 30,000-square-foot instructional Media Wing; and a seven-level parking structure equipped with electrical vehicle charging stations. Primary funding for the $115 million project came from Measure AA, the SMC Safety and Modernization Bond, approved by the voters of Santa Monica and Malibu in 2008. KCRW also launched a capital campaign in 2012 to raise private funds to equip the KCRW Media Center and invest in program development. This Capital Campaign, co-chaired by former KCRW Board Chair Michael Fleming and KCRW Board Member Deborah Ramo, provided the funds to purchase broadcast and digital equipment for the KCRW Media Center, and to acquire new stations in Santa Barbara (88.7 FM) and San Luis Obispo (101.3 FM). Donated support also includes more than $11 million to invest in new programming and technology to distribute KCRW’s content throughout Los Angeles and around the world. KCRW thanks the Annenberg Foundation for its lead support of the Capital Campaign. Major donors to the Capital Campaign include The Ahmanson Foundation, Annenberg Foundation, Borzi Family Foundation, Norris and Debra Bishton Foundation, David Bohnett Foundation, The Rosalinde and Arthur Gilbert Foundation, Conrad N. Hilton Foundation, Chris Hollinger and Elizabeth MacDonald, W.M. Keck Foundation, Kayne Foundation, Ric & Suzanne Kayne and Jenni, Maggie & Saree, The Ralph M. Parsons Foundation, Rosemary Kraemer Raitt Foundation, Roth Family Foundation, Santa Barbara Foundation, Monica J. Shilling, S. Mark Taper Foundation, Ellie and Tom Wertheimer, Lucy Wild and Jason Wolff, and Kristin and Jeff Worthe. KCRW creates and curates a unique mix of content centered around music discovery, NPR news, cultural exploration and informed public affairs. KCRW is driven by the spirit of Los Angeles and delivers in innovative ways—on the radio, digitally and in person—to diverse, curious communities around the corner and around the world. A community service of Santa Monica College, KCRW can be found on the air in Los Angeles, Santa Barbara, Ventura, Mojave, Palm Springs, San Luis Obispo, via the KCRW app, and at KCRW.com. Founded in 1929, Santa Monica College is a two-year community college accredited by the Western Association of Schools and Colleges (WASC). SMC is the leader among California’s 114 community colleges in transfers to the University of California, USC, and Loyola Marymount University. SMC offers over 110 career-focused degrees and certificates—in fields such as Early Childhood Education, Game Design, Animation, Film Production, Accounting, and many more—which prepare students for direct entry into the job market or for transfer, taught by world-class faculty and industry professionals in state-of-the-art facilities. The college provides an affordable pathway to high-demand careers, and a scholastic experience comparable to four-year institutions at a fraction of the cost. This includes the only Bachelor of Science degree in Interaction Design offered at a community college. Santa Monica College serves its community via news and cultural enrichment through its radio station KCRW (89.9 FM) and The Broad Stage at the SMC Performing Arts Center; and lifelong learning through distinctive programs such as its Emeritus Program for older adults. Located in the heart of the entertainment district and “Silicon Beach”—surrounded by numerous media firms and tech startups—the new Center for Media and Design (CMD) unites all SMC programs focused on media content development and design, including the baccalaureate program in Interaction Design (IxD), on one campus. 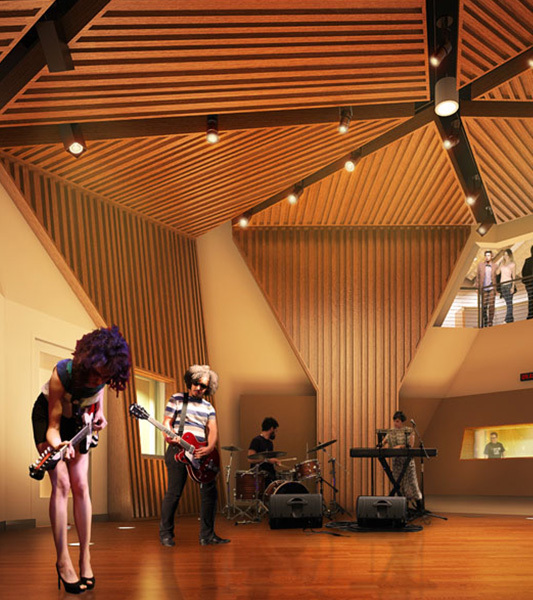 The CMD’s new 30,000-square foot building houses the Media Wing, with a post-production classroom, a student radio station and production suite, multiple editing bays, a television and film production studio with control rooms and green screen, an art studio, café and new 180-seat auditorium. It was designed from the ground up to encourage the type of collaboration critical to success in today’s evolving media environment. The newly renovated 50,000 square-foot instructional facility housing the Design Wing includes computer, design and general education classrooms, faculty offices, Student Services offices, newspaper production rooms, a tutoring lab, a computer lab, meeting rooms and collaborative spaces.